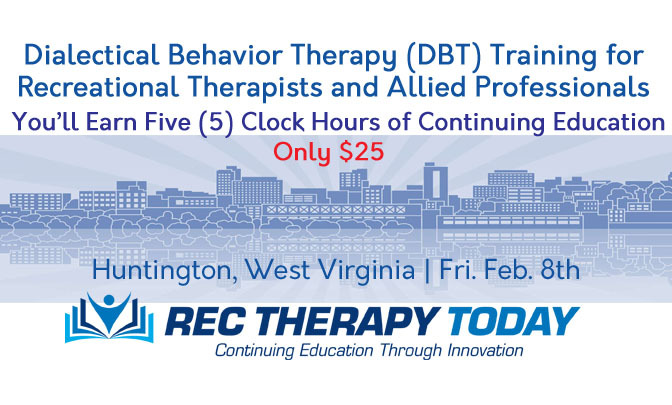 This one-day workshop will be held at River Park Hospital in Huntington, West Virginia on Friday, February 8, 2019 from 8:00 a.m. until 3:00 p.m.
You’ll earn five (5) clock hours of continuing education for attending and participating in this training. Session have been submitted to NCTRC by Rec Therapy Today and are pending pre-approval status. The price for this one-day workshop is only $25. You’ll get a free pizza party too! Notice: DBT was created by Marsha Linehan as a treatment approach for people who have Borderline Personality Disorder (BPD). DBT has been effective in helping people with various other mental and behavioral health needs. This one day workshop provides a brief overview of DBT, however, it would be impossible to cover all of the research and information developed by Marsha Linehan. Recreational therapists can implement several aspects of DBT to help patients. Attend this training and learn more!